I was going to run to the store and buy some dishtowels to embroider, but the aroma of honey whole wheat oatmeal bread baking in my bread machine... well, I just knew I must delay my errand so that I wouldn't miss the best part of the entire bread making process. I posted the recipe in my blog's "recipes" category. It is absolutely the best recipe! Waiting for the aroma to diminish, I needed to switch gears because I didn't have what I needed to begin my embroidery project. Last week, I ran across an idea on the Jane's Apron blog. She used a "collector box", which you can purchase at Michael's Craft Store for $7.00, to display a cutout from the front of a pattern envelope layered on top of a pattern piece. I bought two of them. 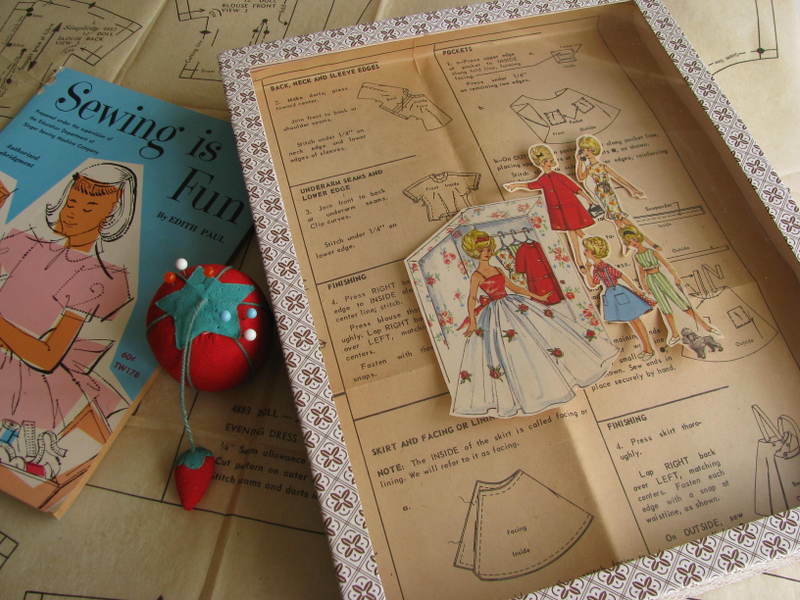 I wanted to put my own spin on the idea by choosing a pattern that had some meaning to me, so for the background I cut to size a direction sheet from a Tammy doll pattern that I had purchased on eBay. I had bought two identical patterns off eBay so I didn't feel badly about cutting up one of them. Tammy was like a Barbie doll and I first learned to sew using a sewing machine in 1962 when I was 9 years old by making clothes for her. I knew that this particular pattern would be perfect for my collector box because the very first thing I made from the pattern was the skirt, so that's the one I chose to focus on. 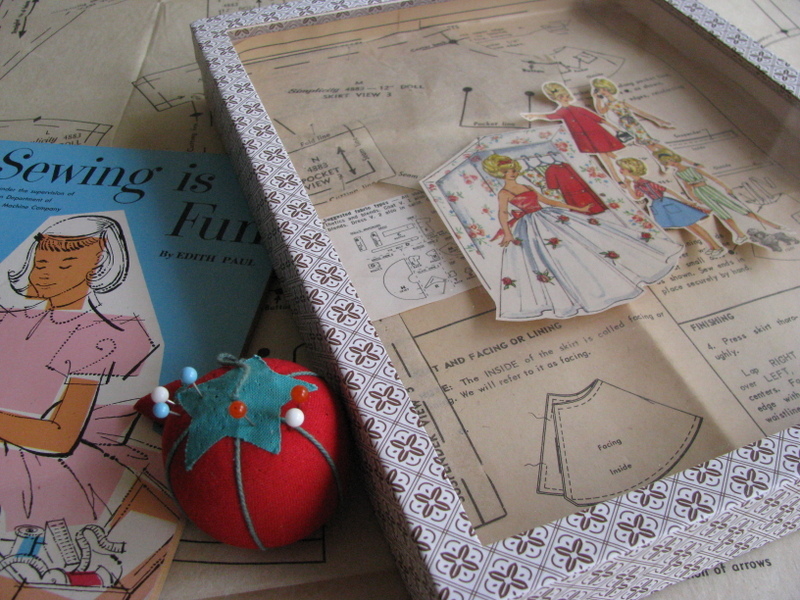 I secured the skirt directions to the inside of the box then pinned cutouts from the front of the pattern envelope on top. 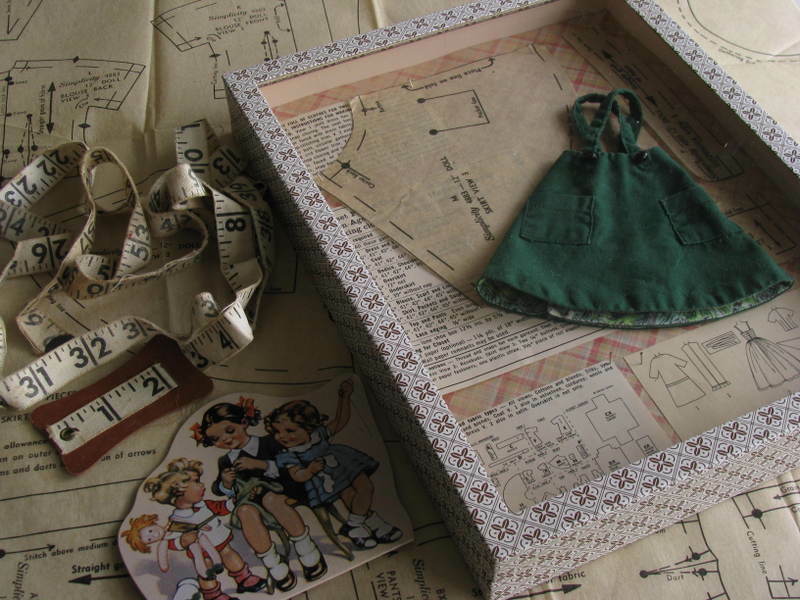 In the second box I layered the original skirt that I made as a child on top of the skirt pattern pieces and information cut from the back of the pattern envelope. The collector box comes with 1-1/2" high pins to secure the items onto a slightly padded backing. You will need to insert the pins at an angle in order for the lid to close or do as I did and use some pins that are 1/2" high... perfect! I rummaged through my craft stash and found them. I don't know what they are meant to be used for. The project went together very quickly and I was ready to hang it. No problem... or so I thought , since there are two ribbons attached to the backside- one if you choose to hang it vertically and the other to hang it horizontally. It felt natural to me to open the lid from the right side to the left, however that's not how the ribbons were positioned. So I needed to flip everything inside the box upside down. Also, the box doesn't come with a latch so when you hang the completed art on the wall, the door falls open. Since my theme is sewing, I may attach (hot glue?) two old buttons directly across from each other- one on the top side and one on the bottom side where the lid opens and closes then wrap a short length of brown and white baker's twine around the two buttons or, instead, I may attach a tiny metal latch.